There is still a chill in the air, but you’re craving the flavors of summer. This simple Broiled Shrimp Feast has all the flavors of summer, yet it is baked on one sheet in your oven. Curing that summertime craving you may be having! Do you have a summertime memory that your mind instantly goes to when you think about fun in the sun? One of my fondest memories was a summer day in my early 20’s. My friend’s family was throwing a little shindig call a Craw Fest. See they were originally from Florida, so they knew how to throw an amazing flavorful party around seafood. Before this party, I had no clue what a crawfish was, let alone how they tasted! That day really defined how I view the flavors of summer. So what do you do when you are craving summer but it’s the middle of winter? No one wants to stand outside in the blistering cold to cook! The first step is to take Garlic, Bay Leaves, Paprika, Clove, Oregano, Thyme, Mustard, Dill and just for a little spice Cayenne and Pepper; mix it together just right. Now you have a creole seasoning blend that will make your mouth dance the happy summer time jig!! Now that you have the flavors, let’s add some substance. Small white and red potatoes keep them whole and as small as you can find. I like to start by cooking these alone first because they take longer. Drizzle with olive oil and add a tablespoon of summertime flavor and toss. Place on a large lined bake sheet and allow to cook for 30 minutes in the oven. The next thing you will add to the sheet is some yummy andouille sausage. Also some sweet and savory corn on the cob minis, I use a total of 8 because, just like anyone with kids, my daughter loves corn on the cob. I add this to the sheet with the potatoes and allow everything to cook another 15 minutes. Finally the true star of the dish…the shrimp!! Make sure they are deveined and the shells are removed, place in mixing bowl drizzle with olive oil and add some summer flavor seasoning; toss until well coated. Shrimp cooks fast that is why it is the final step. Place them onto the baking sheet that has everything else and bakes for 10 more minutes. Remove from oven, they will be very hot, so fit you desire to dig right in and allow it to cool slightly. Now serve with lemon and butter and you got yourself a summertime craving curing meal in the comfort of your own home! Pre heat oven to 375. Line a large baking sheet with non stick baking parchment paper. In a large bowl place your potatoes and drizzle with olive oil and add a tablespoon of summertime flavor, or creole seasoning and toss. Place on a large lined bake sheet and allow to cook for 30 minutes in the oven. Set mixing bowl aside for later! When 30 minutes are up add cob minis and the sliced andouille sausage. Place the baking sheet back in the oven and bake for another 15 minutes. Take the large mixing bowl and place your shelled and de-veined raw shrimp in the bowl with olive oil and 1 tsp summer flavor seasoning or creole seasoning; toss until well coated. When 15 minutes are done add the shrimp to the sheet and bake for another 10 minutes. Allow to cool slightly and serve with lemon and butter. Enjoy!! To make life a little more simple if you don't want to make this seasoning this you can substitute with creole seasoning! Thank you!! I love this spice blend, we use it on chicken and fish as well! This looks incredible! I’m going to try this out this weekend. Hope you enjoy!! Thank you! So I can make this great meal on a big baking sheet. I am so in and will be making this as soon as I get everything. Yep just one sheet pan and a large bowl for mixing. Simple meal…easy clean up… you can’t go wrong! Enjoy! i do this with foil pack but i love the idea on a sheet pan. this is perfect for weeknight as well. THIS IS MY KIND OF MEAL! dump it all out on some plastic bags or butcher paper roll up your sleeves go to town! except, we keep the shell and the head on LOL the more garlic and lemon the better. I think the shrimp hold the flavor more with the shells on and there is no such thing as too much lemon or butter, but my 5 years old disagrees LOL!! But yes a roll your sleeves up, type of meal, those are the best!! Stacey Demrigian recently posted…Being a stay at home wife isn’t all fun and games! Thank you!! I pinned your post “Being a stay at home wife isn’t all fun and games,” because girl you couldn’t be more correct!! Hope you are having a wonderful day! The pictures make me want to try recipe at this very second…it looks so good! I’ll definitely be giving this a go in the next few weeks or so. I’m pretty excited to try it. Thanks for sharing! Thank you!! These pics I was a little disappointed about, but this comment makes me feel better!! Hope you enjoy!! Thanks for the love! Well, I’m hungry now, LOL! Looks and sounds amazing! Sorry to make you hungry I hope it was around meal time at least!! LOL Thank you!! Yum! 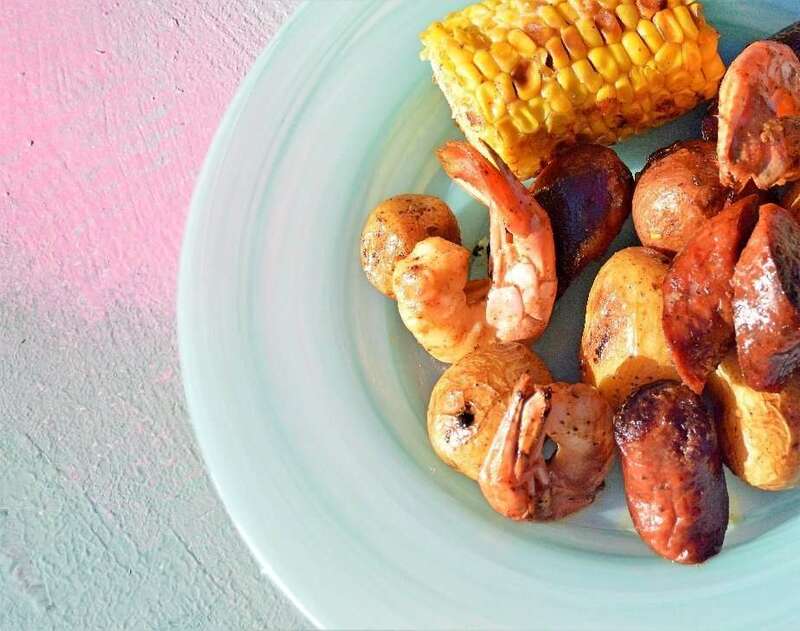 I love a good shrimp boil, but this one sheet oven method sounds so simple, and easy cleanup is such a bonus! I always say the less clean up the better!! 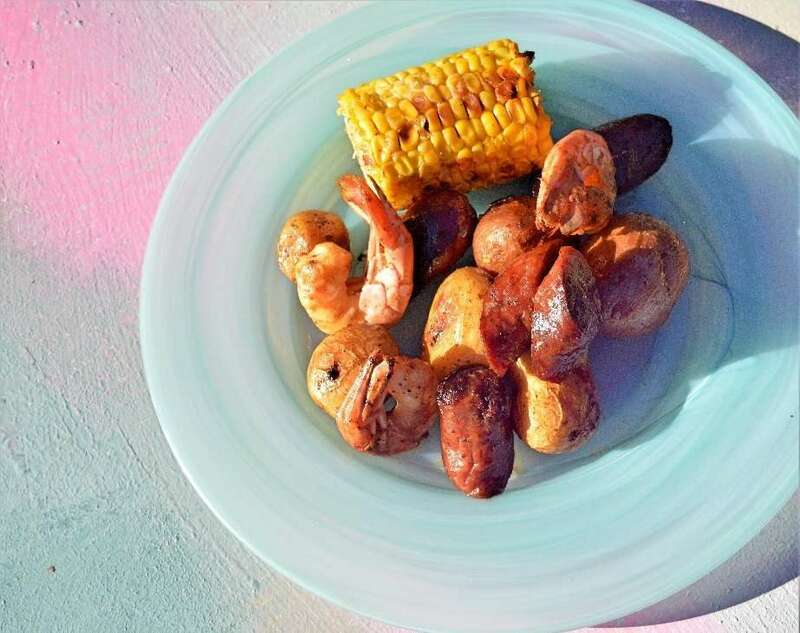 My husband talks about making broiled shrimp like this occasionally, but we didn’t think we had a good way to prepare it. This is a great way to make it, so we’ll be giving it a try soon. 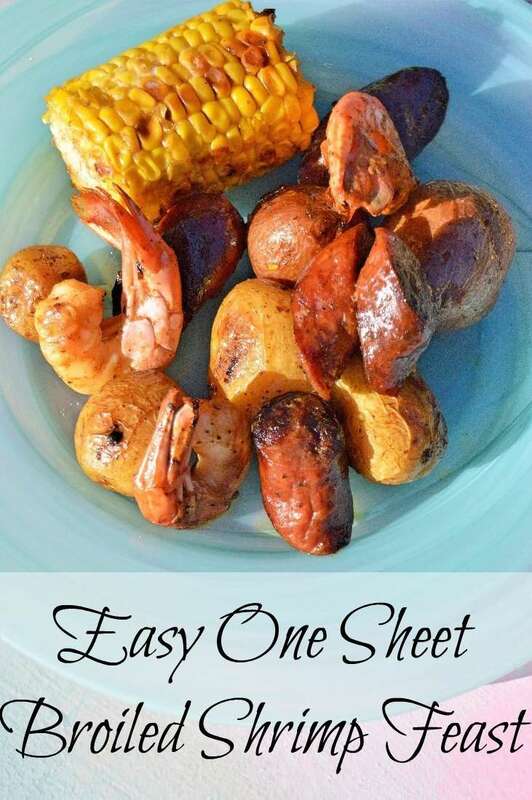 The first time I made this I thought oh so simple and put everything but shrimp on the pan…the end result burnt sausage and corn medium cooked potatoes and the only thing edible on the sheet were the shrimp because I cooked them separately. It’s safe to say I learned my lesson if you place things in stages you guys should be good. I hope you guys enjoy! Thank you!! I always love the shrimp boils I see in the summers, but they can look a little complicated. This looks amazing, and I ADORE sheet pan meals — so convenient! Delicious! Shrimp boils can be a bit messy but if you ever get invited to one you should totally go they are so worth the messy hands!! But! in the mean time this one sheet wonder is the way to go hahaha! Thank you!! I am absolutely pinning this for later! My husband will love it. Thank you for sharing!! Thank you for the pin!! And I am happy your husband will love it!! Have a great week!